– Short dungarees – Front print – Adjustable braces – Side button panel – Two front slit pockets – Two back pockets The Wishbone Overalls by Iron Fist grant a special insight into your inner self. 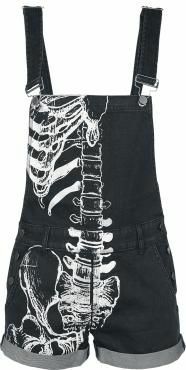 The skeleton print on one side of these laid-back dungarees is a creative study in anatomy. A sight that will chill you to the bone!